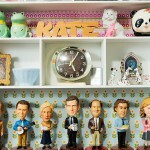 Kate Gabrielle is an ordinary New Jersey girl with love for fashion and all things unique. She runs an online fashion store and also enjoys fashion blogging. 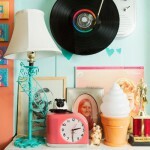 She has a unique distinct style with some retro influence and a definite love for pastel colors. Let’s explore her pastel fashion world from the inside! Kate Gabrielle is an aspiring young fashion blogger who also happens to enjoy life to its fullest. Her blog ranges from her own fashion picks and things she encounters in her strolling. Being featured in the Teen Vogue recently, she revealed her mini office filled with vintage and pastel outfits, charming furnishings and DIY accessories. 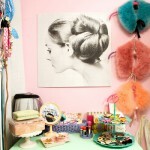 Meanwhile, her style is very intriguing being a combination of 60’s style dresses, cute childish bows and pastels. Pastels seem to be really big in her priorities of fashionable items. Kate also has an undeniable sense for color matching. 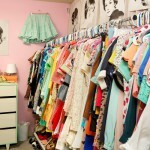 She loves fashion so much that she has decorated her room with some of the pieces, that she seemed to like. My plain white curtains were driving me crazy, but I didn’t want to do anything that would reduce the amount of sunlight streaming through my windows. 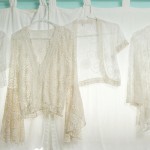 So I decided to hang up some of my sheer lacy tops. Well, that is not all. Her bedroom is also decorated with pretty peach colered lacy dresses fit for little girls. Kate adores flats and has a whole collection on display from mint T-straps from Bait Footwear to shiny red flats from Asos. She also loves cats, and this passion of hers is evident in her shoes, bags, accessories and even her embroidery. 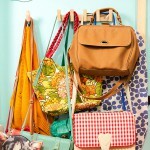 She has a closet dedicated entirely to her fashionable pieces that she keeps in strict color order. So, do you like the pastel fashion world of Kate Gabrielle, or is she too sweet for you?